Southern Bleacher stadium bench seating gives spectators and fans great seating while offering high schools, universities, cities and other organizations a durable, cost-affordable solution that stands up to decades of games and events. 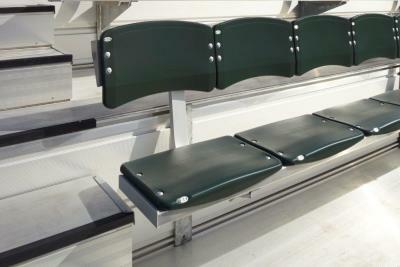 Our bench-style backrests take standard stadium bench seating to a new level in both comfort and visual impact. Made from top-quality extruded aluminum, stadium bench backrests are bracket-mounted to the underside of the bench and can be colored to match your team colors. When adding a backrest your tread depth must be a minimal of 30”. If you choose to add stadium chairs your tread depth must be a minimum of 33”. When planning your new grandstand project or renovation/expansion keep this in mind as spectators expect more comfort for day long events. 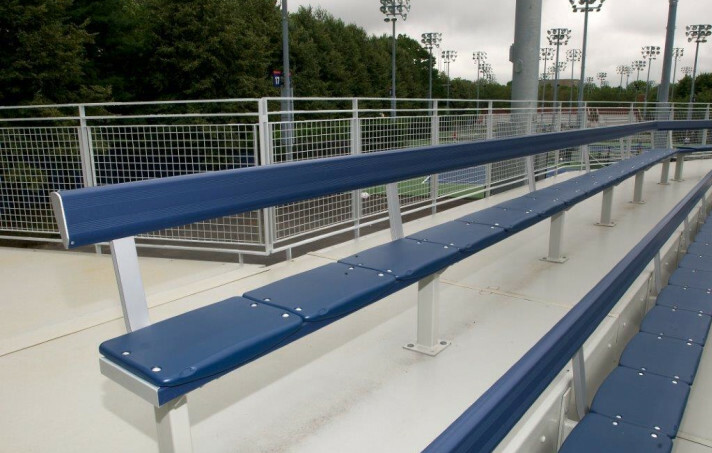 The Southern Bleacher Elite Seat is an economical way to make stadium bench seating even more comfortable and fan-friendly, giving each spectator an individual space while stoking team spirit with bold color. The Elite Seat is made from UV-protected plastic suitable for indoor or outdoor facilities, designed and blow-molded for both comfort and durability and mechanically fastened to your aluminum stadium bench. You can add Elite Seats to your stadium benches by themselves or enhance them with standard backrests or comfort-shaped individual backrests of matching blow-molded plastic. Our aluminum coatings add eye-popping color to your stadium bench seats - a great way to show off your team colors and even showcase names or logos in larger venues.